The argument made by the U.S. administration—as well as the pressure groups promoting engagement with the Iranian regime, backing the “nuclear interim deal,” and encouraging Iranian influence in the region—is that there is no alternative to the Ayatollahs regime in Tehran. Indeed, over the past decade and particularly since 2009 when President Obama sent his letter to Ayatollah Khamanei as a prelude to engagement with the Islamic Republic, voices in Washington and in Brussels have asserted that the Khomeinist regime is strong domestically and is the only option available to the West for stabilizing the region. Thus, despite the obvious common knowledge that the regime and its Pasdaran have been suppressing their own people, meddling in neighboring countries’ domestic affairs, and backing terror networks including Hezbollah and Hamas, the “pro-engagement lobby” has been successful in convincing the current administration—and some in the media—that Tehran cannot be bypassed nor can it be confronted simply because there is no opposition capable of replacing the regime. Ironically, the Mullahs regime has for years aided this assertion by suppressing any domestic opposition to the point of physical elimination. Dissidents have been jailed and killed, students tortured, and anti-regime groups dismantled. The strategy of the regime is also simple: If they succeed in eliminating the opposition and discredit it, the West and the international community will continue to accept the argument that no viable alternative to the regime exists. Thus the retreat of the West, particularly under the Obama administration, has been consistent with the goals of the Iranian government. From ruling out strategic action against the regime’s nuclear facilities to abstaining from supporting the opposition, to allowing Hezbollah to dominate Lebanon, to standing idle while Assad is slaughtering his own people, the global retreat from containing Iran’s rulers has been standing on one central assumption—the presumption that no force can challenge the regime from the inside. Tehran’s rulers have shown their determination to eliminate any challenging force. What should have been two major opportunities toward replacing the government were reversed to instead solidify the regime’s power. In 2009, the regime repressed massive demonstrations in several cities with no response but an astounding silence from the U.S. and the West. While the protests demonstrated that millions of Iranians—particularly youth and women—opposed the regime to the core, the argument was made that no organized force could confront the power of the Ayatollahs’ guards and agencies. The sympathizers of engagement with the regime argued that masses alone could not bring down the ruling elites. The second move by Iran was actually against the organized resistance, most notably against its bases in neighboring Iraq. With the withdrawal of the U.S. from the country at the end of 2011, Iran’s allies in Iraq eliminated Camp Ashraf, site of the most important and most organized armed resistance against the Ayatollahs. Via assassinations, torture and takeover of the camp, Iran was able to crush what it considered to be the single-most dangerous evidence of a strong and capable opposition to the regime. With Ashraf occupied and Camp Liberty at the mercy of the attackers, Tehran claimed victory over the MEK and other components of the opposition worldwide. The claim of “no-alternative to the regime” was again used by the regime’s propagandists. But a massive rally in Paris organized by the National Council of the Iranian Resistance (NCRI) proved just the opposite. It drew close to 100,000 Iranians from around the world and included the participation of prominent public figures from the United States, Europe and the Middle East. In her speech to the world, thanks to a powerful organization of the event, the leader of the Iranian Resistance, Ms. Maryam Rajavi, reminded those listening that an alternative to the Islamic Republic regime exists on the political map. The crushing of the 2009 demonstrations and the invasion of Ashraf in 2011 did not shut down the opposition. The June 2014 Paris rally demonstrated that political opposition to the regime is as strong as it has ever been. More international politicians than ever before, from all along the ideological spectrum, expressed solidarity with the MEK-led movement in exile. The high level of participation by Iranian youth and women provided further evidence that the spirit of the opposition has consolidated and has grown more abiding. Media coverage was also greater, and—ironically—Arab participation, including both Sunni and Shia, was wider. 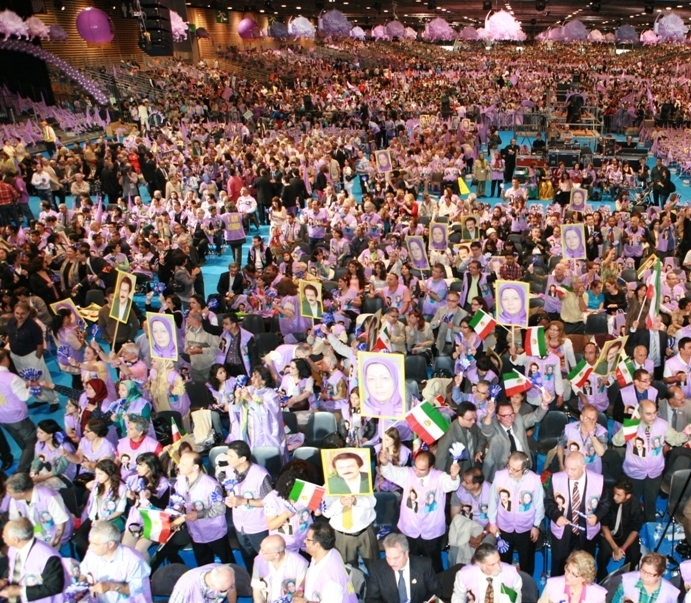 The Iranian national resistance was able to show the world that despite systematic criticism and regime propaganda efforts, there is an alternative that has popular support and is capable of challenging the medieval regime currently ruling the country. In short, there is another Iran that continues to flourish and grow in exile. The choice is up to the United States and the West: Continue to feed the ambitions and the life of the Jihadi regime in Tehran—or help its alternative replace it with a pluralistic, secular and peaceful government.